Of the rock artists making their debut on record during the genre’s first two full years, meaning those who hadn’t yet recorded previously in another style, nobody can top the actual verifiable commercial success of that initial offering by the artist we’re meeting now, Billy Wright. 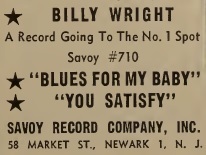 Though rare for any artist thus far to have scored an actual HIT with their first record – something which only Roy Brown, Big Jay McNeely, Chubby Newsom, Hal Singer and The Orioles among rock acts have all achieved in Billboard to date by 1949 – Billy Wright has them all beat, as BOTH sides of his first release were Top Ten hits. This side in fact was the bigger one, topping out at #3 compared to the flip-side’s #9 placement. It doesn’t mean however it was the better song or performance. You Satisfy was a perfect record. Grand entrances to the national stage are few and far between unfortunately and so when you get the chance to unveil to modern readers someone who is already deserving of far more historical credit than they’ve been granted, that’s not an opportunity we’re going to pass up just for the sake of A-side/B-side semantics. But the other reason is more practical in nature which is the inescapable fact that Blues For My Baby is cut from the same cloth as its better flip. Therefore whatever insight offered on the musical aspects of both records would be better served showcasing them at their peak usage rather than one that just misses those marks. Don’t get carried away though by that explanation, for this side is still really good in own right and by virtue of its success is also really important in the big picture rock was now framing. Yet if Billy Wright was going to wind up being more than just a kid who captured the attention of an audience with something unexpected the first time out before fading into obscurity, then he would have to shift gears somewhat unless he wanted to take his place alongside Jimmy Liggins as someone who covered the same ground time after time. Fear not, Wright will do that soon enough lest there be any suspense, but for the time being we have to understand who he was, where he came from and what he was dealing with in terms of opportunity to see why that might take awhile. When saxophonist Paul Williams shared a stage in Atlanta with a local teenage singer named Billy Wright he was suitably impressed with the kid’s vocal pipes and stage presence honed in his time as a transvestite performer in local Minstrel Show revues. Ever the good company man Williams called his producer at Savoy, Teddy Reig, to tell him about his find and Reig came down to Atlanta to check him out for himself. Equally impressed Reig wanted to get something down on tape as quickly as possible and rather than send him up the Eastern Seaboard to New Jersey to do a proper session in Savoy’s studios he instead took him into a local radio station that had the facilities to record and cut him doing some songs, both sides of his debut single among them. Now the reasons for this could be logistical. You want to be able to see if what had sounded so good on stage would translate on wax. Perhaps he even wanted to use Williams’s band on the tracks if he got down there soon enough (though it’s credited to Howard Callender, a horn player who was also singer Lil Green’s husband at one point, so maybe Reig – who knew everybody in music – found that Callender was touring in Atlanta and pulled him in to accompany the singer… who knows?). But then again Reig also might not have wanted to pay to have this kid travel up to New Jersey for a session there knowing that Herman Lubinsky, Savoy’s cheapskate owner, probably wasn’t even going to pick up Reig’s travel expenses let alone an underage cross-dressing artist, so why not save some money? Then again it was all too common back in this time for producers to tell an artist they were cutting them to “see how they sound” and then use the so-called practice session as a release to avoid paying them altogether. I tend to doubt that in this case because the band is too well rehearsed and the fidelity is really good, so it sounds like this was a full blown professional session, but you never know. The other reason – and maybe the most practical one – is that there was of course no guarantee that this kid’s songs would find an audience and it was far less hassle to simply cut him locally, stuff some cash in his pocket and release the records. If they flopped then you’ve already washed your hands of him. But if they did manage to draw some interest then nobody would complain about going to the trouble of bringing him into the home studios for a follow-up session down the road. But that all leads to the reasons for why Blues For My Baby bears such a strong resemblance to You Satisfy. Namely, how many original compositions would you expect a seventeen year old rookie to bring with him to the table for his first recording session that was cut only days, if not mere hours, after meeting the producer? So they basically re-worked the one good melodic idea he came there with to make a second song out of the same basic formula. That means there’s hardly the potential for much diversity, something we take particular interest in when assessing an artist’s work especially when looking at two sides of the same release, but in this case due to the circumstances involved it can be excused to a degree. That said if one side IS better, that needs to be made clear and so that’s the side we chose to introduce Wright with on these pages. But while Blues For My Baby may in fact be the lesser of the two sides artistically, with so many of the same components it’s still got more than enough going for it to be well worth the time. I guess we should start with the differences so nobody thinks I’m saying these are all but identical recordings. Of course the songs aren’t the same which is largely due to the arranging skills of whomever is leading the band. 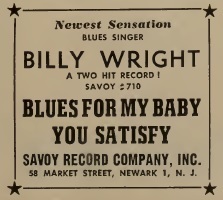 Whereas You Satisfy had a very long and dramatic intro that set the stage for Wright’s entrance, Blues For My Baby cuts to the chase a little quicker as well as altering the mood to one that sets up a more pensive reflection. An elegiac sax takes the lead before Wright comes in with a subdued tone, crying about another romantic loss (THAT hasn’t changed, he still can’t catch a break!). While the lead-ins definitely had their differences however, the prime thrust of both songs, their melodies and deliveries, are much the same. Wright takes on a similar mournful tone as he recounts his loss. Maybe it’s even the same girl at different stages of the breakup for all we know, it might as well be. What’s changed though is his introspection which had featured so heavily in the other side of this record and frankly was what made that one sparkle so much. There he seemed to be really gnashing over the entire concept of love itself and how it makes you disregard your own best instincts until it left you a feeble wreck. But on Blues For My Baby, though the mood is much the same, the insight is missing. This is a person who is reacting with little more than raw emotion and instinct rather than trying to understand his feelings and come to grips with the powerlessness of his predicament. He’s still in control of himself, there’s no emotional thrashing about here, his singing is carried off with laser-like precision, but in doing so he’s focusing more on the ache itself and the events which brought about those feelings rather than analyzing the psychological causes of that ache as he’d done so well on the other side. For those who care less about words than someone who… well, someone who uses words (thousands of them) to analyze these records for instance… then maybe the differences won’t seem so profound. That might have the effect of negating the one side’s advantage over the other, or it could even possibly make the two songs seem even closer to one another and therefore both might suffer equally from the similarities. For me though the lyrics, and how they’re delivered, is the best window available to peer into the mind of the artist themselves. To try and understand not just what they’re thinking in terms of the plot line, but what they’re thinking in terms of reaching an audience and expressing some elemental truth to them in the process. Not all songs or singers need to aim high every single time, there’s plenty of hedonistic songs that barely use intelligible English in their lyrics that are worth ten times that of other songs that are striving to be profound, but in other cases you want to get some sense of the type of person you’re dealing with, especially when meeting them for the first time. That was precisely what Wright had done on You Satisfy and why the relative absence of that contemplative nature here is regrettable. Blues For My Baby is still effective, but it’s the cliff notes version of the same basic story and so while you can’t complain about what it delivers, you can quibble somewhat with the details it leaves out. Billy Wright clearly had all of the performing ability required to want to hear more from him in the future. His voice was strong and clear and incredibly emotive. His delivery was just as powerful, knowing not only to emphasize the lyrics for maximum impact but also how to interact with the band, which here consists of some very good melancholy horn work that is drawn out until it almost aches with pain. Even the compositions themselves, both bearing the co-writing credit of Reig who almost certainly had little to do with them other than possibly some arranging suggestions, are well-crafted and provide very realistic perspectives, good use of detailed descriptions to convey his mindset and a few excellent metaphors thrown in for good measure. In other words, you’d be taking bets that Wright would be heard from again in the future and you’d of course be correct in that presumption. But hearing these both together, side by side, before either one made their first ripple of impact I’m not sure you’d think Blues For My Baby would be the one to cause the bigger splash. Well done though it certainly is, it’s lacking a more varied arrangement (the entire song never shifts gears once, unlike the other side), it has a far narrower sound palette and much less for a listener to dig into lyrically. Then again, what IS here comes across very well and if you’ve recently been burned in love and can relate to the sentiments expressed here you might not be so indulgent to listen to somebody else weigh the psychological aspects of the experience in a song when you could simply turn the record over to this more elemental side and moan away in grief alongside him. 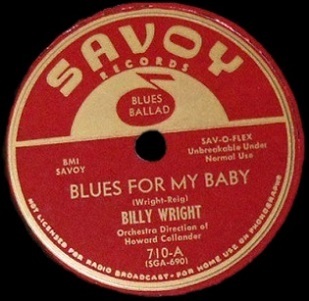 Leave a reply on "Billy Wright: “Blues For My Baby”"